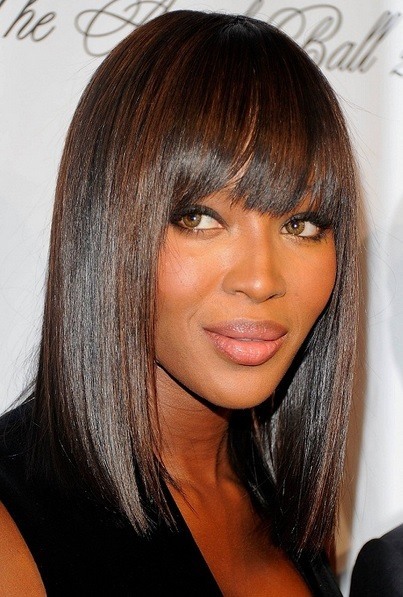 It is hard to imagine a hairstyle that doesn’t look stunning on Naomi Campbell’s .. It is hard to imagine a hairstyle that doesn’t look stunning on Naomi Campbell’s face. Her extra short bob is moderately layered with few strands gently touching her cheeks, making this “sore spot” of heart shaped and round face appear a bit narrower and drawing more attention to eyes. 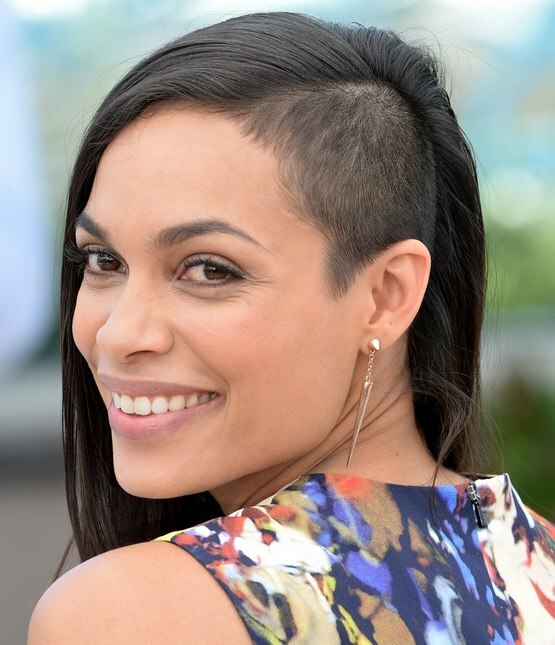 Style is amplified with slightly choppy ends of her full bangs. Attention! If your face is clubbed to above mentioned shapes, do not cut those bangs too wide! Tired of your long, naturally straight hair? It can’t be easier and effective than t.. Tired of your long, naturally straight hair? 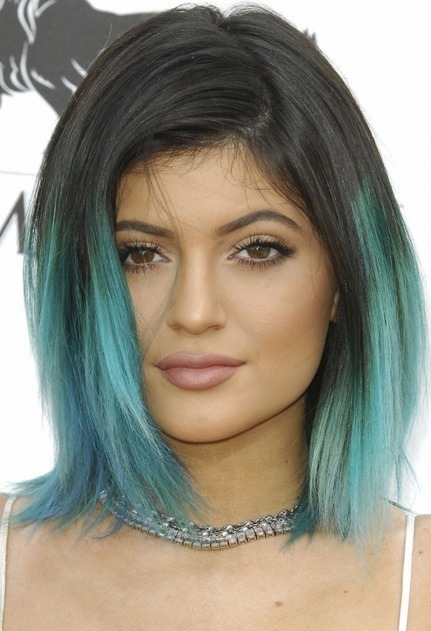 It can’t be easier and effective than this: change the length and add blunt bangs! The Panther of the catwalk is keeping it simple with her straight blunt haircut. For extra sleek hair that glow, add a few drops of shining serum, blow dry your bangs slightly to the side and you are fully ready for both everyday and evening occasions. We are absolutely in love with ash blond highlights on Kim Kardashian’s dark blon..
We are absolutely in love with ash blond highlights on Kim Kardashian’s dark blond hair! She sure is stunning with dark brown and jet black hair, but she is not a bit less breathtaking as blonde. These layers are very much emphasizing the multicolor perfection. If you are blessed with hairdresser who mastered the layered haircut, then you need nothing more but straightening iron, heat protection serum and reliable product to boost some shine in those locks and repeat this style on your own. Looking for a quick solution to turn your long mane into elegance? Say ‘yes’ to h.. Lets be straightforward and admit that Alessandra’s drop dead gorgeous face would.. Lets be straightforward and admit that Alessandra’s drop dead gorgeous face would look just perfect with any hairstyle. At least this one is easy to copy. A day old hair is easier to handle. Use paddle brush to collect your hair at the crown and secure your ponytail with elastic. Take 1,5” section from the tail, coil it around elastic to conceal it and secure with bobby pin. Brush your ponytail for neat finish and apply small amount of shining serum. What else to expect from a model but to be fashion aware? Rosie arrived to Met B..
What else to expect from a model but to be fashion aware? Rosie arrived to Met Ball 2014 wearing her long, blond hair middle parted, loose and sleek at the top, as seen on runways this year. Depending on your hair type, you can opt for hair gel or creme to make your hair smooth. Whichever of the two makes it appear wet instead of oily, apply it on the top sections of your hair and comb it down to the level of your cheek bones. With chic accessorizing, even a very easy to repeat hairdo can look absolutely am..
With chic accessorizing, even a very easy to repeat hairdo can look absolutely amazing! Beyonce’s hair here is middle parted and wrapped in simple chignon at her nape. 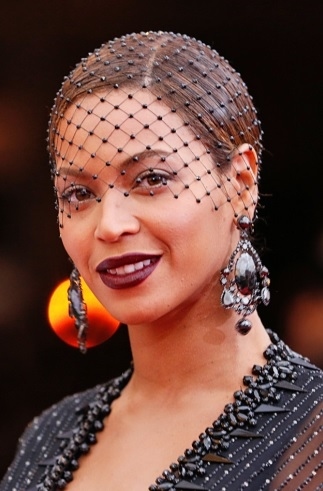 That which made her style redcarpetly appealing is this beaded birdcage veil. The only catch with this vintage little thing is to match it properly with what you are wearing (this Givenchy Haute Couture is example of excellent match), so it is for very special occasions only. Wet look is one of the most forward runway hairstyles of this year, looking stunn.. Wet look is one of the most forward runway hairstyles of this year, looking stunning on both medium and long hair. It is of utter importance to choose hair products which don’t make your hair appear greasy instead of wet, shiny and fresh. After applying wet look hair product to the roots of your hair on the crown, comb it towards the ends, part your hair from the middle and make sure it is perfectly sleek on both sides. We love the combination of smokey eyes and this style.